Painter Nguyen Thu Thuy has received the silver trophy at the International A’ Design Awards for her artwork at the Mirror House in downtown Hanoi’s Thong Nhat Park. The awards ceremony took place at the Teatro Sociale Opera House in Como City, Italy, on June 30. After the ceremony, the honored works will be featured at an exhibition held at the Museum of Outstanding Design (MOOD) in Como until July 4. Thuy won the Silver Trophy in the category of Public Arts Design for Society and the Environment. This year, the organising board received 1962 nominations from 100 countries in 99 different disciplines of design. 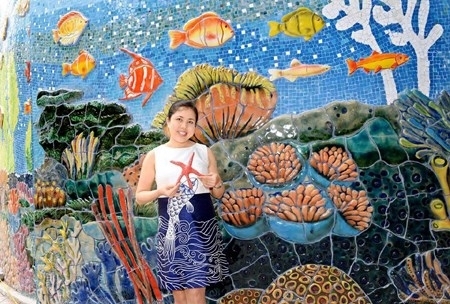 Speaking at the ceremony, Thuy said she felt happy to have a chance to renovate the House and turn it into an artistic structure decorated with ceramic designs inspired by the ocean. “The Mirror House, or Laughing House, was built in 1979 with support from the former Czechoslovakian government,” she said. “It was built in the shape of a huge snail shell, with 50 mirrors providing distorted reflections of visitors.” “Last year, I used ceramics, the traditional material of Vietnamese art, to coat the Mirror House,” she said.